This entry was posted in TRANSCRIPTION: MIYAMOTO and tagged agilist, Agiliste, cyberpunk, episodic, episodic iphone games, iphone, iphone games, protopunk, science fiction, scifi, steampunk, syfy, videogames. Bookmark the permalink. 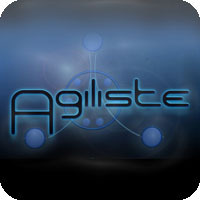 The Agiliste game is now available on iOS and ANDROID devices! The Agiliste prequel is now available on Amazon, Smashwords and e-readers everywhere.